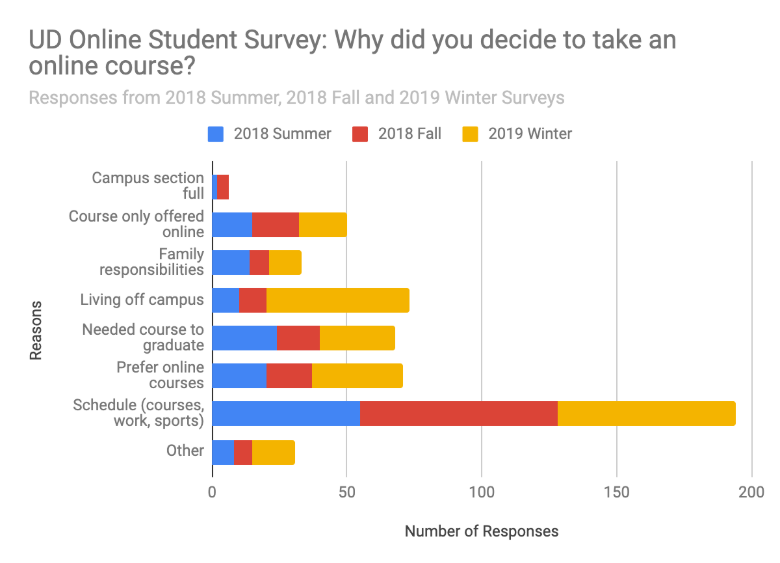 Every term, UD Online distributes a survey to students enrolled in online courses to learn more about their experiences with online learning services such as the UD Online Testing Center. Students are asked why they chose an online course that term and may indicate multiple reasons for their enrollment. The vast majority of respondents are undergraduate students. The most common responses given were related to convenience. The most popular reason indicated was the ability to schedule courses around other coursework, jobs, and sports schedules. Online learning allows students to stay on track with their coursework while they manage other schedules and priorities in their lives. Particularly in the summer, students living off campus prefer the convenience of taking their courses remotely. By moving a course online, it becomes available to more students. There are a number of resources available to instructors who may be interested in moving their courses online. Visit UD Online Faculty Resources for more information. If you are interested in learning more about motivations and considerations for “going online,” join us at the Summer Institute on Teaching on June 5-6, 2019. Faculty who have successfully launched online programs and courses will be attendance to share their experiences and insights. For more information on how to register for SIT, visit https://sites.udel.edu/sit/. Unfortunately, the vast majority of students taking online courses are looking for a class with LESS work than “in person” courses. In fact, most get annoyed if they have to do any work, since their expectation is that they will have do much less for an online course. That’s interesting, I have seen the reverse. Some students I know avoid online courses with the idea that is easier to sit in a class for 3 hours a week and take 2-3 tests.